we will email it to for you to print or email. Vouchers cover a party of up to four people and will be personalised with your recipient’s name(s). It includes a tour of the vineyard, personally conducted by either Iain or Jane, and a leisurely tasting of our current range. included in the price, your recipient(s) can choose any three bottles from our current releases to take home. All recipients must be 18 or over. We will email a pdf file of your voucher to you, for you to print, normally within 24 hours. 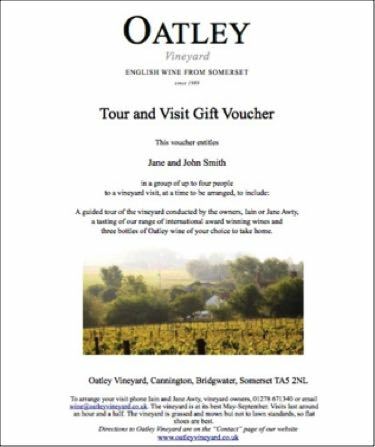 The voucher includes contact instructions so that your recipient(s) can arrange a date and time of their choice. The vineyard is at its best from May to September but we can accommodate other times. Vouchers are valid for next summer and the summer after. BEFORE you press “Add to Cart” enter your recipient(s)’ names as you want them to appear on the voucher.